Savannah’s first Methodist Church, Wesley Chapel, was established in 1807 and located at the corner of Lincoln Street and Oglethorpe Avenue. The congregation later purchased a lot on Telfair Square where they erected the present Trinity church building. In 1862 Wesley Chapel was closed, and the two churches became one, known as Trinity Church. The Reverend A. M. Wynn was serving as pastor of Trinity when at the third quarterly conference in 1866, plans were formulated to establish a city mission. This was done with services of the new mission being held in the old Chatham Academy building until early 1868. On January 19 of that year Wesley Church was organized to replace City Mission with 54 persons enrolling their names that day. In April of 1868 the Congregation moved from the schoolroom to a church located on the space now occupied by the educational building of this church which Trinity had purchased from the Lutherans and renovated for use by the newly formed Wesley Church. Trinity church also owned the lot facing Calhoun Square, and by 1874 plans were proceeding for the erection of a new church building on that lot. It was to be a monument to John and Charles Wesley. Ground breaking for the new edifice was held on June 30, 1875 and the cornerstone laying ceremony was on August 10th of that year. In December 1875, when the church was already under construction, the South Georgia conference passed a resolution approving the erection of a monument to John Wesley in the form of “a beautiful and commodious edifice” to be called Wesley Monumental Church. Because of financial woes during the period of reconstruction and a catastrophic yellow fever epidemic, work proceeded slowly. It was May 12, 1878, that the first phase of the construction was completed and the street-level area was occupied. 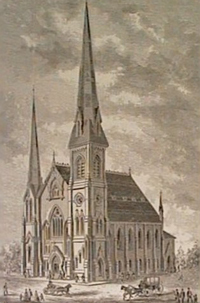 Twelve more years would pass before the sanctuary on the second floor was finished and dedicated on May 30, 1890, though the steeples and the stucco were not in place at that time. At the December 1875 South Georgia conference when the church was named, the conference also approved the solicitation of funds from Methodists all over the world to aid in Wesley Monumental’s completion. Funds were solicited and contributions were received from many areas of the world. For this reason, it has been said that Wesley Monumental Church belongs to all Methodists. We are privileged to have this place in which to worship, and we have a responsibility to be good caretakers. The beautiful memorial windows of European stained glass were in place, each one dedicated to one of Methodism’s historic personalities. 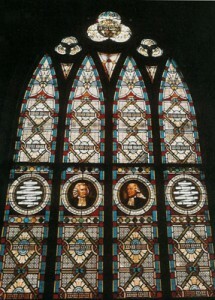 The “Wesley Window”, which faces the pulpit from the rear balcony, shows life-sized busts of John and Charles Wesley, and at the top of the window a globe bears John Wesley’s famous utterance, “The world is my parish”. The needlepoint altar kneeling pads, lovingly stitched by the members of our congregation with that same logo, were dedicated on June 25, 2000. The church is patterned after Queen’s Kirk in Amsterdam, Holland. It is in the Gothic architectural style with spires measuring 136 and 196 feet in height. The height of the sanctuary from floor to ceiling is 43 feet. Twice, in 1946 and in 1953, fire has caused extensive damage but due to a steel ceiling in the sanctuary, which had been installed in 1902, the fire was contained and the sanctuary saved from destruction. Ground breaking for the new Educational building was on June 21, 1926, and the dedication ceremony was on February 20, 1927. It was at the time of that construction that the outside steps and door leading to the sanctuary were added. The lower floor had been partially redesigned and the little Chapel of Memories added in 1953 following the fire. The magnificent Noack Organ, designed and built by Fritz Noack of the Noack Company of Massachusetts, was dedicated on February 19, 1985. The gothic style of the organ case is a beautiful addition to the sanctuary and is compatible with the architectural style of the church building. 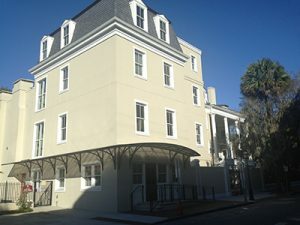 The Clark-Espy House, dedicated as Oliver Hall in 2015, next door on Wayne Street, was purchased in 1958, and it was used for Sunday School classes, young people’s meetings and social gatherings. Later, it was divided into apartments and rented for many years. The church offices now occupy the ground floor, reception spaces and adult Sunday School classes are on the second through fourth floors.